June 22, 2019 is the 50th anniversary of the Cuyahoga River fire of 1969. This fire was by no means the first fire on the river (at least 13 others were reported prior to that) or even the biggest (the largest fire caused more than $1 million in damage). But the 1969 fire landed Cleveland in TIME magazine’s report on the nation's environmental problems - and put Cleveland in the history books as a catalyst for environmental policy change. 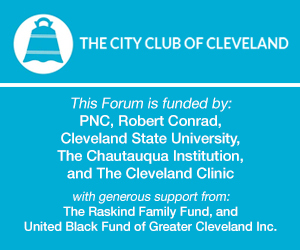 Leading up to the 50th anniversary of the fire, the City Club will be hosting Igniting the Future, a series of conversations on how the Cuyahoga River fire and its aftermath set the stage for the modern environmental movement. The events in Cleveland and the activism and advocacy they endeared, led in large part by Mayor Carl Stokes and his brother, Congressman Louis Stokes, were integral to the passage of the Clean Water Act, the establishment of the Environmental Protection Agency (EPA), and the first Earth Day celebration on April 22, 1970. Denis Hayes left Harvard Law School to work with Senator Gaylord Nelson on organizing the first Earth Day which was celebrated by 20 million Americans. In the ensuing decades, Earth Day has grown from a grassroots effort into an international event celebrated in 192 countries, moving environmentalism from a fringe issue to a mainstream concern.